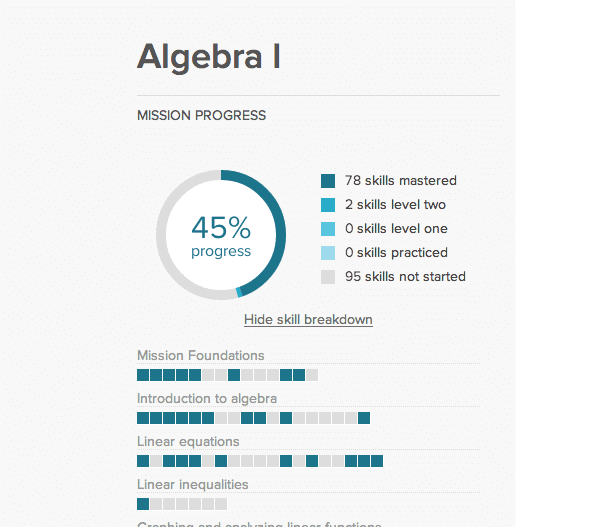 The new learning dashboard is your personal homepage on Khan Academy. The dashboard gives you an easy way to find the best next things for you to do. It has a bunch of really cool things designed to help you learn math, and soon other subjects, really well on your own or with a coach. You can access it when you’re signed in by clicking on the Khan Academy logo at the top of the page. Recommendations have been lined up for you on the dashboard. They should have the skills that are best for you to practice next. If you want to practice something in particular, no problem! It’s a breeze to add the skills you want to focus on to your dashboard. 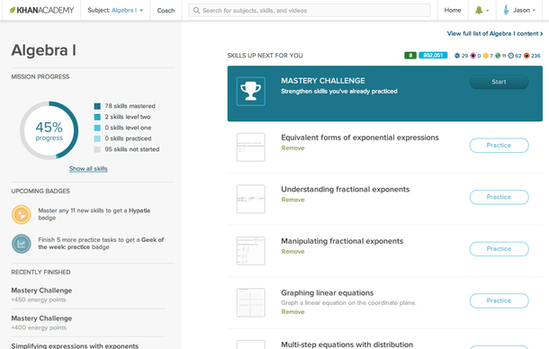 If you have a coach helping you learn on Khan Academy, they can recommend skills for you too. Each day, we will unlock new chances for you to level up the skills you practiced on previous days. “Why do I have to wait a day for a chance to level up?” you ask. “I want to get new levels now!” Here’s the thing, there’s a lot of evidence that proving what you know over time is a really great way to ensure that you actually remember what you’ve learned. We hope the challenges are fun and rewarding as we’ve updated badges to recognize Mastery earned this way! As you’re leveling up your skills, you can keep track of progress right on the dashboard. Points, badges, and skill levels are all visible and updated in realtime. Earn points and badges; Conquer the world of math! We’ve added new badges and updated the old ones to work with the new skill levels. You now earn bonus points for doing recommended skills and even more for leveling up your skills. The entire KA team has been working around the clock over the last few months to bring this exciting new experience together. Although we’re just getting started with it, we’re thrilled to see how you all use it and to get your feedback. Sign in to get started with the pretest, and get credit for what you already know. Onward! Want to learn a little more? Sal made a cool video about the learning dashboard! Check it out here.